All these functions are used to attach an event handler function to the selected elements or selectors. In this article I will take you through all the four set of functions to get an idea of what it is. To start with, let me list down all the functions with short description and release details. Which function to use? confused let’s go through the below details then you will be in a good position to decide which one to use and when. The .bind() method is used to register an events to existing html elements and .unbind() method is used to remove events, that are registered by .bind() method. eventType:- A string containing one or more DOM event types, such as “click” or “submit,” or custom event names. eventData:- An object containing data that will be passed to the event handler. handler(eventObject):- A function to execute each time the event is triggered. preventBubble:- Setting the third argument to false will attach a function that prevents the default action from occurring and stops the event from bubbling. The default is true. events:- An object containing one or more DOM event types and functions to execute for them. handler(eventObject): The function that is to be no longer executed. false: Unbinds the corresponding ‘return false’ function that was bound using .bind( eventType, false ). The above code will cause a click on the element with ID foo to report the page coordinates of the mouse cursor at the time of the click. .live() method is used to add event handler to elements that are currently available in the page or dynamically added to the page whereas .die() is used to remove any handler that has been attached with .live(). Note: .live() and .die() are removed from jQuery version 1.9.
data:- An object containing data that will be passed to the event handler. events:- A plain object of one or more event types, such as click or keydown and their corresponding functions that are no longer to be executed. Now all the static and dynamically created links will have the alert method event attached. 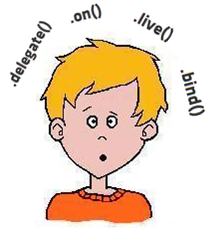 .delegate() method behaves in a similar fashion to the .live() method, but the major difference is that It attaches the event handler to the context , rather than the document. 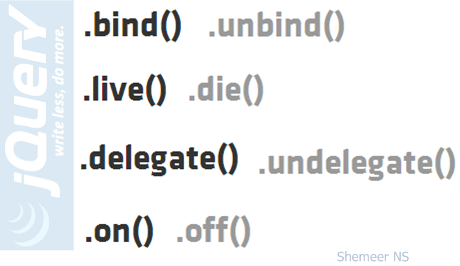 The .undelegate() method is a way of removing event handlers that have been bound using .delegate(). selector:- A selector to filter the elements that trigger the event. events:- A plain object of one or more event types and functions to execute for them. selector:- A selector which will be used to filter the event results. handler(eventObject):- A function to execute at the time the event is triggered. events:- An object of one or more event types and previously bound functions to unbind from them. namespace:- A string containing a namespace to unbind all events from. The .on() method attaches event handlers to the currently selected set of elements in the jQuery object. The .on() method provides all functionality required for attaching event handlers. The .off() method removes event handlers that were attached with .on(). selector:- A selector which should match the one originally passed to .on() when attaching event handlers. events:- An object where the string keys represent one or more space-separated event types and optional namespaces, and the values represent handler functions previously attached for the event(s). The above code will be attaching the specified event to all (current and future) <p>. Below code block is taken from jQuery 1.7.1. You can see that for all the above listed methods the .on() method is being “overloaded” with different signatures, which in turn changes how the event binding is wired-up. The .on() method bring a lot of consistency to the API and hopefully makes things slightly less confusing. return arguments.length == 1 ? All the these jQuery functions are used to attach events to selectors or elements. Some methods performs better in some situations. If you are using jQuery 1.7+ then its advised to use .on() over all the event binding methods. In this article I have given detailed explanation of jQuery methods that’s used for attaching/removing event handlers. I hope you have enjoyed this article and got some value addition to your knowledge.